Both teams pick up victories in their battle for the Metropolitan Division title. 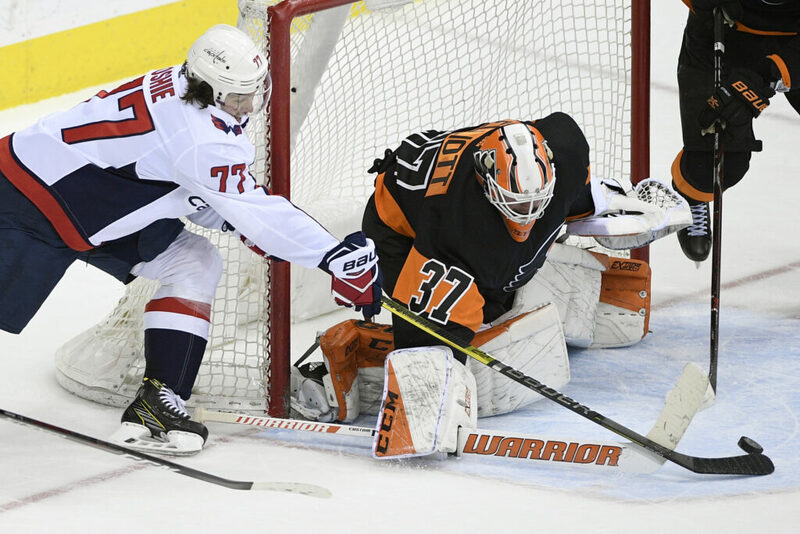 WASHINGTON — Braden Holtby made 35 saves to compensate for an inconsistent effort by his teammates, and the Washington Capitals beat the Philadelphia Flyers 3-1 on Sunday afternoon to snap a two-game skid. Holtby helped Washington kill off three of four Philadelphia power plays as the Capitals avoided what would have been their first three-game losing streak since January. Tom Wilson, Travis Boyd and Jakub Vrana scored for the defending Stanley Cup champions, who stayed one point ahead of the New York Islanders for first place in the Metropolitan Division. Jakub Voracek scored a power-play goal and Brian Elliott made 27 saves for Philadelphia. ISLANDERS 2, COYOTES 0: Jordan Eberle and Brock Nelson scored to back Robin Lehner’s fifth shutout of the season as New York won at home. Lehner stopped 31 shots to help the Islanders win for the second time in two days and keep pace with first place Washington in the Metropolitan Division. Both teams have six games remaining, including a matchup at Washington in the season finale on April 6. The Islanders, who beat the Flyers 4-2 on Saturday, improved to 11-1-1 in the second game of back-to-backs. HURRICANES 2, CANADIENS 1: Andrei Svechnikov scored with 1:45 left in overtime as Carolina rallied to beat visiting Montreal. Carolina’s Trevor van Riemsdyk scored the tying goal with 5:39 remaining, and Svechnikov ended it with a wrist shot. Curtis McElhinney stopped 28 shots. Carolina remained alone in the first wild-card spot in the Eastern Conference. Montreal squandered a chance to move into a tie with Carolina, but still holds a four-point lead over Columbus for the second wild-card berth.